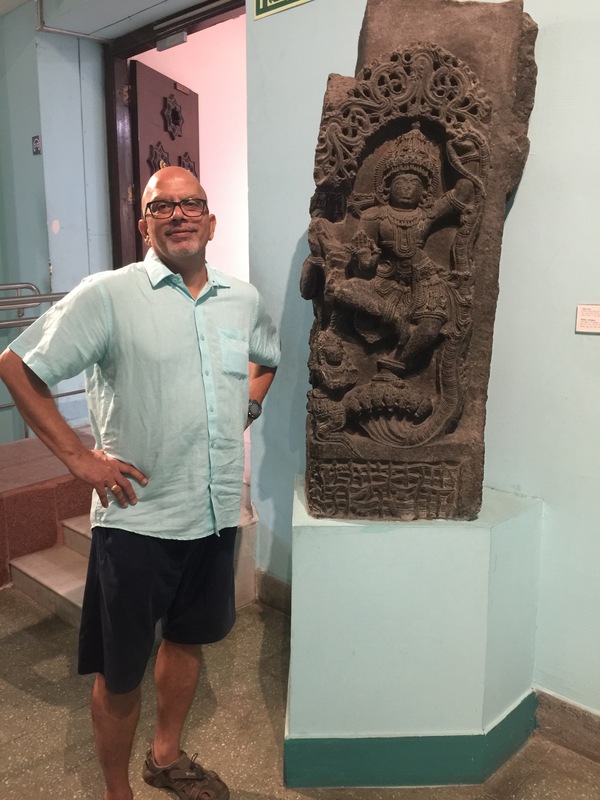 On September 1st, Krishnan and I visited the National Museum. Where else will history buffs start ? :). The National Museum is spread over three floors and it will take you nearly three days to truly see every artefact on display. 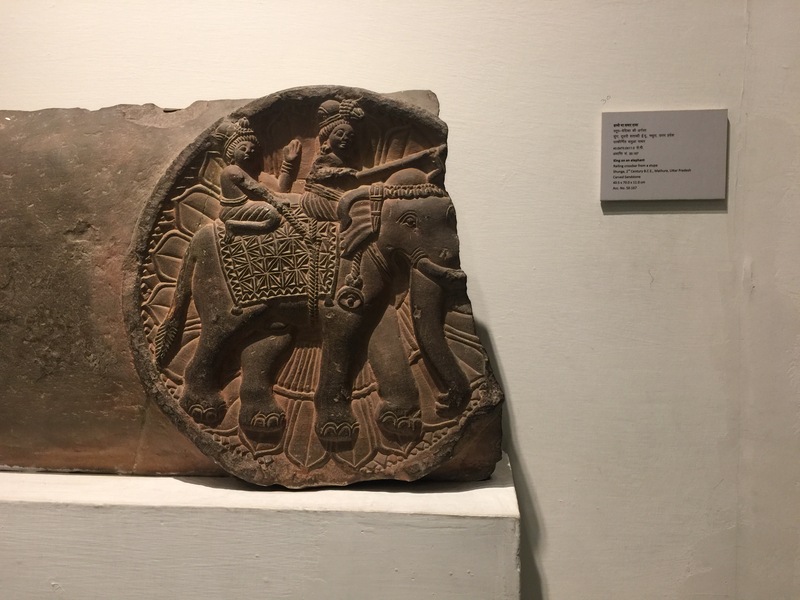 The ground floor has artefacts from the Indus Valley civilisation, sculptures from the medieval period, Buddhist artefacts, Bronze sculptures, Miniature paintings, history of how several scripts developed and a whole room dedicated to jewellery. We could only do partial justice to the ground floor by spending nearly 3.5 hours …. partial justice because we didn’t spend time looking at every sculpture and every painting. That would have taken another 3 hours easily. As you enter the museum, after getting your ticket, its a small corridor that leads you in. The corridor is filled with sculptures too – well, who better than “Mohini” to get you hooked. I just stood looking at this statue for a few minutes… doesn’t it feel like she will suddenly say “hello” ? Read more about “Mohini” here – Mohini. Legends say Lord Ayyappa is born to Shiva and Mohini (Vishnu’s female avatar). Interesting. 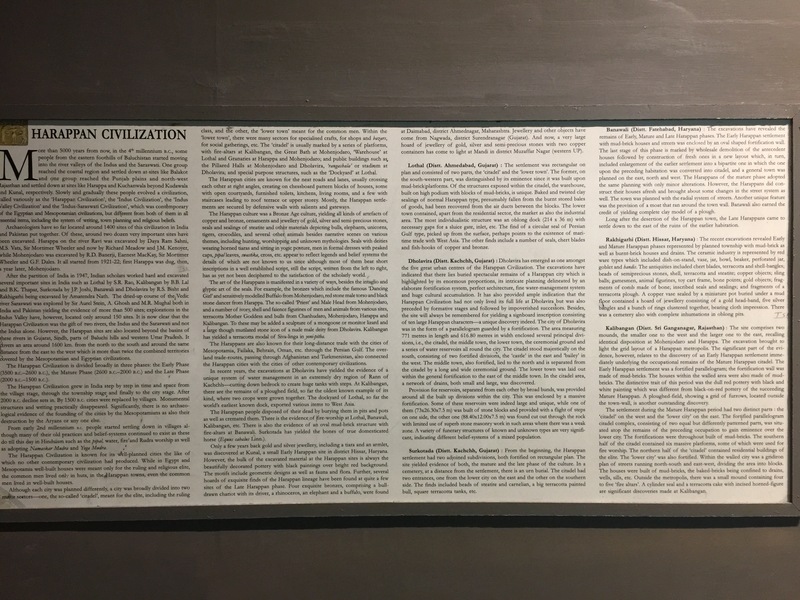 We started with the Indus Valley Civilization and yes, its fascinating to see how advanced that civilization was. They had weights and measures, and smelted copper was probably imported and made into printing plates and other agricultural implements. Read more about Inscribed copper plates from Indus valley (Harappan) civilisation. They had yoga too !! 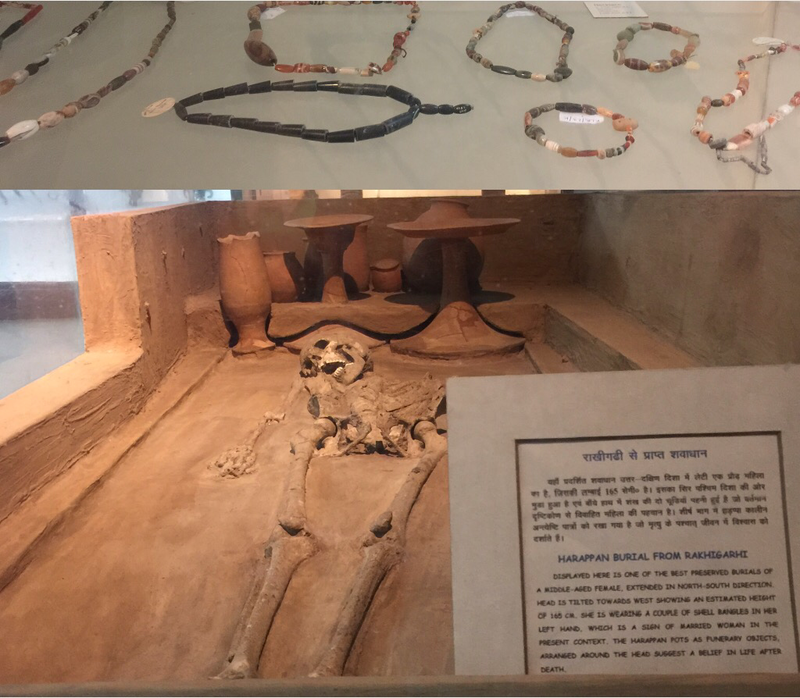 The picture below is the skeleton of a lady found at Rakhigarhi, and she even has her shell bangles intact. I have pasted a picture of the jewellery from that period on top of the picture of the lady’s skeleton. 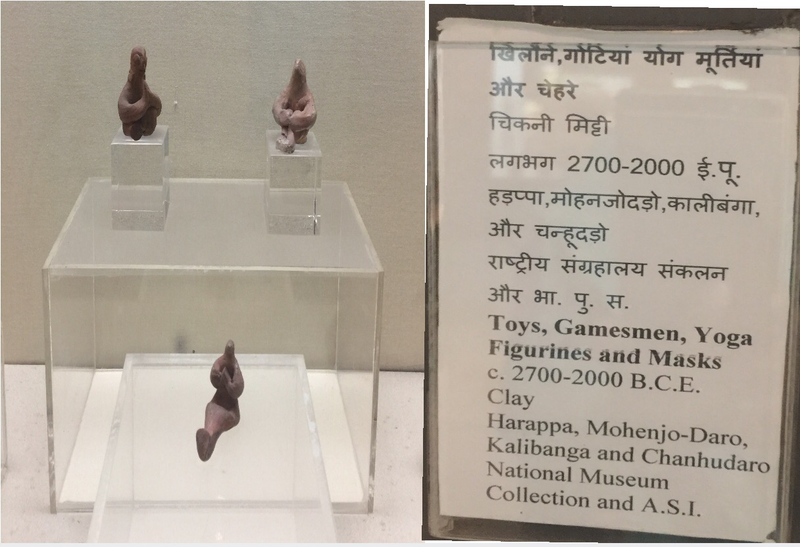 From the huge gallery that holds several artefacts from the Indus valley civilization you move into several galleries having sculptures from the Shunga dynasty (2nd century BCE) and then the medieval periods. The detailing on the stone is so fine … its unbelievable. The picture below is me standing with the sculpture of “Yogini Vrishanana”. Very interesting history of “yoginis” and this particular piece was stolen and sold to a private collection in France. This was returned to India in 2013 and is nearly 1100 years old. 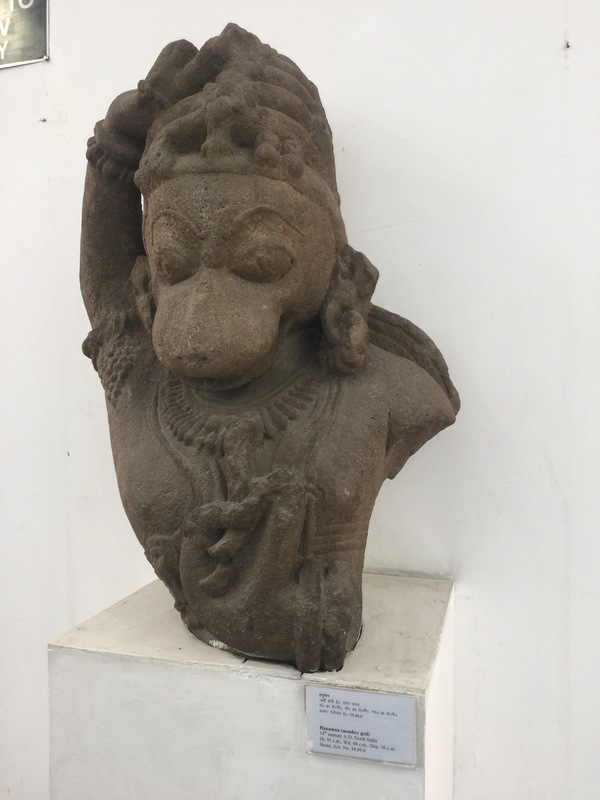 Once stolen from a UP temple, 10th century Yogini idol returns to India. 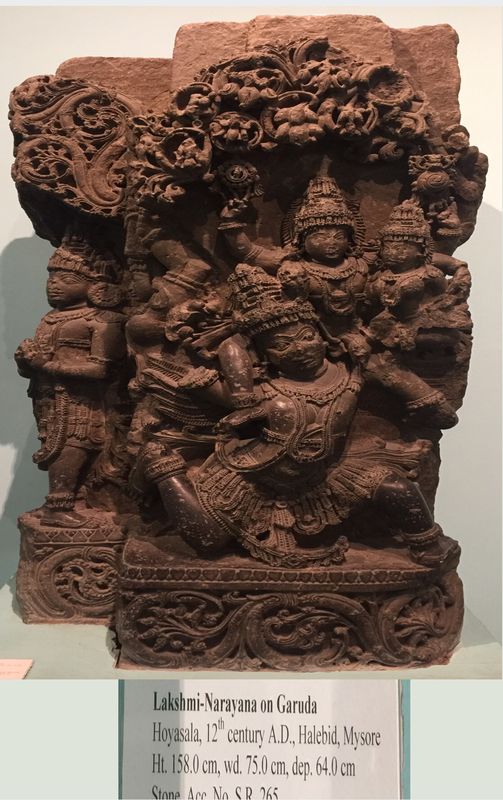 The next sculpture that was sheer poetry in stone was from the Hoysala collection, 12th century AD. The following one is of Lakshmi Narayana being carried by Garuda. Read more about Lakshmi Naryana and Garuda. In Egyptian mythology too, the falcon God Horus is very important…. Falcon, Kite, Eagle, all make an appearance in the ancient civilizations. The eye of Horus is infact the symbol used by doctors when they write out a prescription. 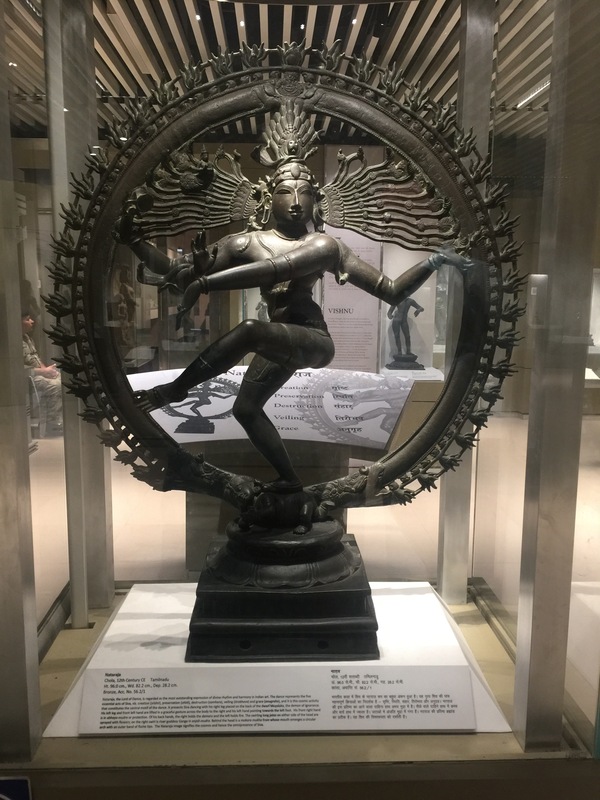 There is a whole gallery filled with Bronze sculptures and the most magnificent of them is of course the Nataraja statue. The Bronze sculptures are displayed beautifully in a very modern setting. 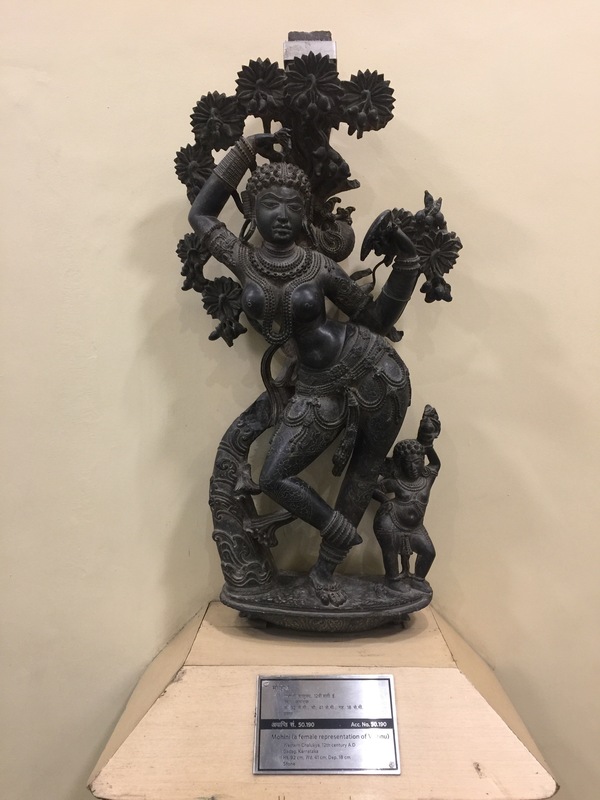 Just before we exited the Medieval sculptures and entered the gallery containing Buddhist artefacts, we found another Hoysala period beauty – Krishna dancing on the serpent Kaliya. So here is the modern Krishnan in shorts and Lord Krishna in stone dancing away on Kaliya. The matching colors of Krishnan’s shirt and the walls is sheer coincidence :). We sat down in one of the benches that are placed all over in each of the galleries as our feet started to hurt at this stage. Also a big group of Sri Lankan tourists entered the Buddhist gallery so we let them go in first. We didn’t know that the gallery contained sacred relics of Gautam Buddha unearthed from Piprahwa, Distt. Siddharth Nagar, U.P. The tourists removed their footwear and we did too. Everyone kneeled down in front of the relics and I didn’t think it was a good idea to take any pics there. After the Buddhist gallery we moved into the gallery containing miniature paintings. There are thousands of paintings and each one is more exquisite than the other. Didn’t take any pictures here. From the paintings we moved into an interesting gallery that showed the development of different Indian scripts. From this gallery you enter the next one which is more modern 18th to 20th century and artefacts made of silver, ivory and wood. There was a lamp carved out of ivory that was just stunning. Here is one that depicts the life of Buddha, again carved out on a single tusk. A very interesting gallery is the “Anubhav” gallery which has a few artefacts that you can touch. The inscriptions are also in braille for visitors who are visually impaired. 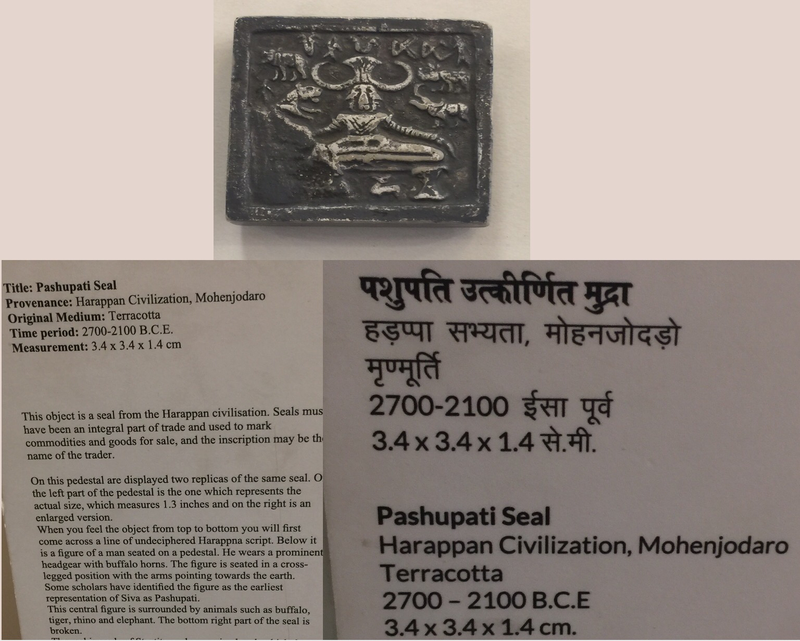 This was when I touched a seal made during the Indus valley civilization… Can a history buff ask for anything more? We then walked out and realised that there were more sculptures on display just outside. I found a sculpture of Hanuman and immediately took a picture for mom as he is her favourite God. We have to go back another time and visit the first and second floors. We were exhausted with just the ground floor !! Do visit the National Museum, and if you are an Indian, you will certainly feel a sense of pride in our heritage. The sculptures are stunning … and their workmanship says a lot about our artisans then. We need to bring back the same quality to the products we make in India. Thats the proper way to remember our legacy. Now, can I have a decorated elephant to travel around on? and a Hoysala sculpture to contemplate upon? No? Just get me the sewage system from the Indus Valley Civilization – that’ll do ! !